Teaching Boomwhackers ® in the music classroom is fun and easy when you combine learning with playing! 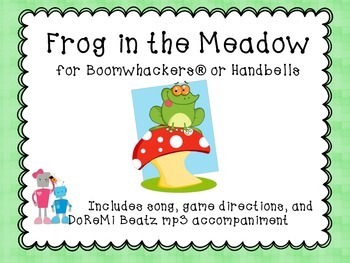 Students of all ages love to sing and play the traditional Frog in the Meadow song game. But when you follow-up by teaching them the song on Boomwhackers ®, and add in the modern rock feel with the DoReMi Beatz backtrack, they will remember the experience and want to do it again and again! Moving and singing to the game ensures that they will be able to quickly learn the song and internalize the pitches and rhythms. This original composition adds a modern rock feel to your Kodaly or Orff based music classroom, keeping even upper grade students engaged and excited! 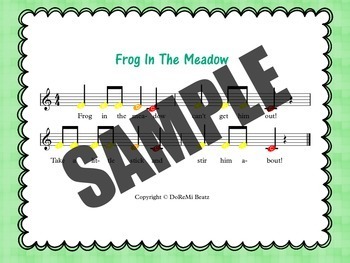 * A practice slower tempo mp3 backtrack of "Frog in the Meadow"
* An upbeat mp3 backtrack of "Frog in the Meadow"
LESSON EXTENSIONS: The "Frog in the Meadow" mp3 is composed in the key of C, so it's versatile enough to also be used with Orff instruments, ukuleles, harmonicas, handbells, resonator bells, xylophones and more! Great for large or small music groups, music listening centers, or even private lessons. 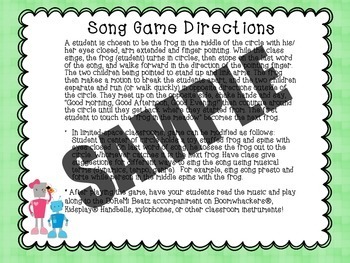 This one-of-a-kind mp3 composition brings a unique sound that all grades K-6 will want to repeat again and again!